San Jose, CA: Hackers turned activism into action this past weekend at a new hackathon for women and non-binary folks. 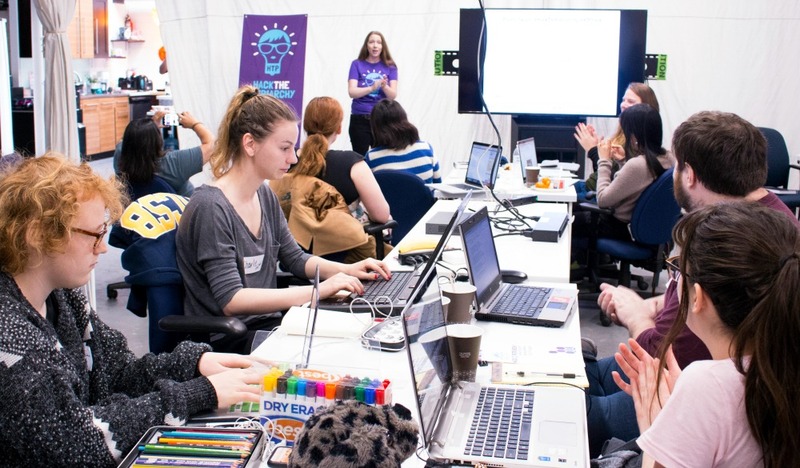 With only a weekend to build their projects, the teams in the inaugural Hack The Patriarchy hackathon went after some of the biggest problems facing women and marginalized communities – sexual harassment and abuse, workplace equality and HR, finding positive news in an aggressive media landscape, women’s health and hygiene, and helping the homeless. The free hackathon received more than 110 applications and accepted 82 registrations. 58 people attended over the course of the weekend. Five teams with 23 team members made it through to the final presentations. The Grand Prize was won by Tusker App, which uses AI to identify and flag verbal abuse, discrimination, or harassment. The People’s Choice Prize was won by Help. (“Help Period”), a peer-to-peer app that helps women — including homeless women — who need tampons or pads in an emergency. The hackathon was held at the ActionSpot co-working space and incubator in San Jose. Teams competed for a prize pool worth more than $4000, including a $500 cash grand prize, Amazon Echo Dots and gift cards, a membership to ActionSpot, and the chance to pitch to investors and join the incubator program. Tusker App: an App that listens to conversations for “the elephant in the room” and uses AI to identify and flag verbal abuse, discrimination, or harassment, using sentiment analysis and natural language processing (Grand Prize Winner). Help. (“Help Period”): a peer-to-peer app that provides a platform for empowering women to help other women in their times (of the month) of need. The App is designed to help women who need tampons or pads in an emergency, and to facilitate donations of hygiene and sanitary products to homeless women’s shelters (People’s Choice Award). Choose Your Win: an interactive game to navigate issues that women face in the workplace and when job seeking, such as negotiating equal pay. Users user can play the game and navigate the recruitment and hiring process through their character (Most Original). Athena: Your confidant in the workplace – an AI chatbot that collects experiences and provides training for appropriate behavior and reactions. It helps employees dealing with harassment and other issues to find information and coaching, and to navigate HR workplace processes (Best Chat Bot). The Daily Reach: a news aggregator that features the accomplishments of women, trans, and non-binary people. In a world of negative news, this aggregator seeks out positive stories for marginalized communities (Most Positive Impact). About Us: Hack the Patriarchy is a social impact hackathon where women and non-binary folks hack together in a safe and supportive environment to build projects that improve life for women and marginalized communities. Participants come from diverse backgrounds, ranging from first-timers to seasoned hackers, and form teams that include developers, designers, activists, marketers, and entrepreneurs. Teams have a weekend to build an initial product or prototype, and are supported with mentoring, resources, pre-event workshops, and training. 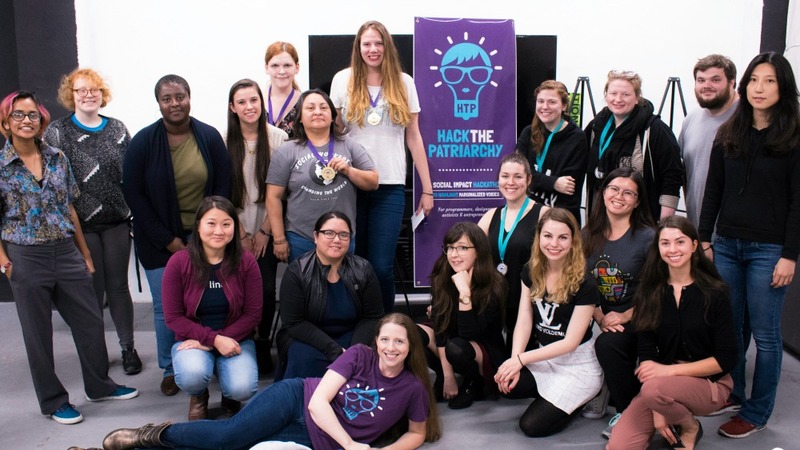 Hack The Patriarchy is a mission-driven, not-for-profit community event founded to empower women and allies to take action and fix problems by hacking on solutions together. Base career progress on business results and performance, not presence. Identify women of potential and give them sponsors and mentors. A critical piece of an organizational goal for gender parity and other issues of diversity and inclusion among the workforce is transparency and communication about results. Sharing numbers internally about participation, promotion, recruitment, and other commonly measured metrics for diversity keeps this issue in the forefront, and measures progress. Paradigm for Parity hopes to have 50 companies agree to develop organizational goals for gender parity using their action plan by March, 2017. Some companies that have already committed to the plan are The Huffington Post, Cargill, Coca-Cola, LinkedIn, Nordstrom, and Bank of America. In many ways, start-ups are the ideal job for millennial and progressive people of all ages. They offer flexibility, innovation, and opportunity to grow. However, not all start-ups are as progressive in their social practices as they are with their business practices. Start-ups in Silicon Valley have been long criticized for their sexist policies and company culture. The following start-ups are woman-tested, woman-approved. Investment is one of the hardest industries to break into for women, but this start-up investment firm is female-focused with more than of half of investments being led by a woman. This firm also demonstrated its commitment to women when it hired Ellen Pao, the woman who made history by suing a famous Silicon Valley venture capital firm for discrimination. Although this company may not be seen as a start-up anymore due to its rapid growth, Lyft has distinguished itself by having one of the lowest gender pay gaps of only seven cents on the dollar. 81% of women report feeling valued by their coworkers. They also offer one of the longest maternity leaves in the United States at 12 weeks. This tech company is most notable for starting WordPress.com and also owns the spam filtering software, Askimet. The start-up may only have a staff of 24% women, but men and women receive raises at equal rates. This is no small feat in the tech industry, where the gap is typically much larger. The Southern Poverty Law Center has a long history of teaching and providing educational resources on the subjects of tolerance, inclusion, diversity, and race through their Teaching Tolerance Project. Their roots in the civil rights movements in the 1960s has made them a long-standing expert in this field. Children today are seeing different examples of systematic racism and violence, and the information they are accessing and discussing is not always balanced and accurate. The Teaching Tolerance Project has developed a crowdsourced group of resources for classroom teachers to use in discussing current issues of race, tolerance, and institutional violence in America. Race, Racism, and Police Violence is a collection of lesson plans, resources, blogs and articles, with external resources, and includes information about how to respond when violence touches the classroom. These are complex, divisive issues. Our children are trying to make sense of what is happening. Teachers can guide their discussions and provide them with a balanced view of what is happening and how to respond. Education Week has a list of resources for teachers and by teachers about how to address race and deal with students of all grade levels responding to violence in their communities. The DC Public School system has adopted a group of resources teachers can use to facilitate discussions in the classroom called Preparing to Discuss Race and Police Violence. This list of suggestions and resources was adapted from the Teachable Moments classroom lessons of the Morningside Center for Teaching Social Responsibility.